Fate finally kicked in when my small business, Parfait Studio, hit a crossroads several years back. I started considering the possibility of utilizing my graphic design and writing skills to support other vegetarian businesses…and vegan ones as well, by association. This concept seemed too good to be true. Could I partner with other animal advocates and still have enough cash to buy tempeh bacon and non-leather shoes (among other necessities)? I was willing to give it a whirl, and the research began. Clearly, I had a lot to learn about a 100% animal-free lifestyle. I could recite my reasons for being an “ethical vegetarian,” but I didn’t fully understand — or had conveniently blocked out — the facts that compelled people to go vegan. It didn’t take long to uncover them. These external changes were big ones, but the most crucial adjustment took place internally. 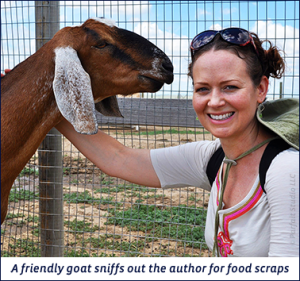 I felt energized by my profession again, and eager to do my best work, not just for the sake of pleasing my clients or honing my craft, but because there was something bigger at stake: the lives and well-being of animals everywhere. Suddenly, the process of designing and writing felt less like a job and more like a vocation. Tapping into this vein of awareness lifted the veil that was dividing the “personal” me from the “professional” me: I realized there was no discernible difference between my life and work goals…and that was exactly how it should be. 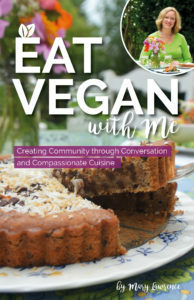 Q ~ What if my vegan focus somehow alienates my current clients and prospects? A ~ First off, keep in mind that anyone who’s put off by your compassionate focus probably won’t make a good client for you (and vice versa). That said, most people — vegan or otherwise — are intrigued by specialization, since making a conscious choice to support a particular group or cause shows courage and initiative. Less-than-perfect prospects will often weed themselves out for you…and, in some cases, may even introduce you to someone who’s a better fit! Q ~ Will I have a hard time attracting vegan and animal-friendly businesses? A ~ Finding the right clients, and ensuring the fit is a good one, is an ongoing process. If your product or service is solid, and you’re willing to thoroughly invest your time and energy in getting your name out there, persistence and patience will eventually pay off. Dream clients don’t typically stumble through the front door without a bit of encouragement, so introduce yourself to those whose work you follow or admire, and let them know you’re keen to partner with them. Q ~ Can I actually make a living by doing what I really love? A ~ Yup, you can. You may not be able to purchase that dream home tomorrow, but remember that you’re doing this for the animals…not for the big bucks (no pun intended). Offering the occasional trade/barter or pro bono work can be a good way to get your foot in the door and/or support your favorite vegan group, but don’t devalue your products or services. Regardless of how much you want to team up with a client, it’s important to ask for what you’re worth! So, should you “veganize” your vocation? In the end, it’s all about what feels right for you. For me, it’s extremely satisfying to know that I’m channeling my efforts to increase awareness and reduce animal suffering through my business practices. If you have the opportunity to merge your head with your heart — whether you happen to be a photographer, an accountant, or an IT specialist — I’d strongly suggest giving it a shot. Five years ago, you couldn’t have convinced me that I’d be cultivating a vegan client base…let alone that I’d be a vegan myself! The ride has been both challenging and rewarding, but when I stopped hiding from the facts and decided to take action, almost every aspect of my life changed for the better. Truthfully, it feels good to be found. Robin Ridley is an experienced graphic designer, wordsmith, and ranch dressing addict (plant-based, of course!) who lives and works in sunny/snowy Denver, Colorado. 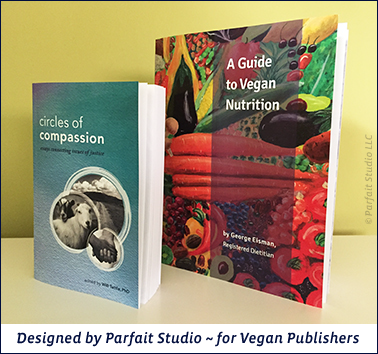 Through her creative business, Parfait Studio, she partners with other vegan and animal-friendly folks to spread the word about their compassionate products and services. Follow her on Facebook to see more of her work! Excellent post, Robin! Working for myself wouldn’t be nearly as rewarding if I weren’t combining my need to make a living with my desire to make the world a better place. It’s so exciting to have colleagues who feel the same way!